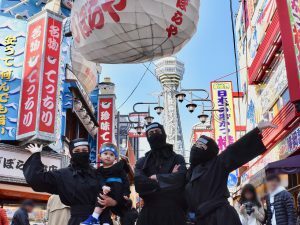 The ninja costume rental service will end in April 2019. See our calendar to check whether we are open. 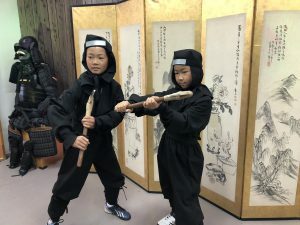 You can take a picture in ninja costume in Ninja-Do house (use your own camera) and have a Shuriken experience ( 5 times ). See the calendar and fill in the application form. You need to inform us of your cancellation by e-mail. After that, we’ll answer your e-mail. Your cancellation will be completed when you receive our e-mail. Cancellation fee varies depending on the day when your cancellation is completed. 1) Take Nankai Line to Namba Station. Get off at Shin-Imamiya Station. 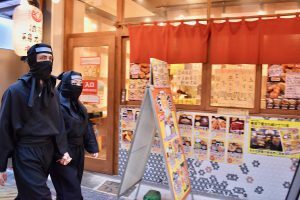 3) Take Subway Midosuji Line or Sakaisuji Line. Get off at Dobutsuen-mae Station. EXIT(3). 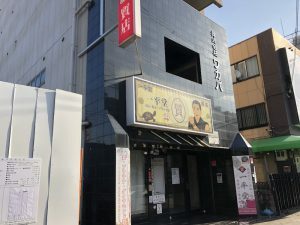 ★It is just a minute’s walk from [Shin-Imamiya station] and the subway [Dobutsue-nmae station]. 2) Take Subway Midosuji Line from Umeda Station to Dobutsuen-mae Station. EXIT(3). the calendar and fill in the application form. After we receive your application, we’ll send you the e-mail where the contents of your application and the information about the payment are written.